New software versions offer new features to entice upgrading. 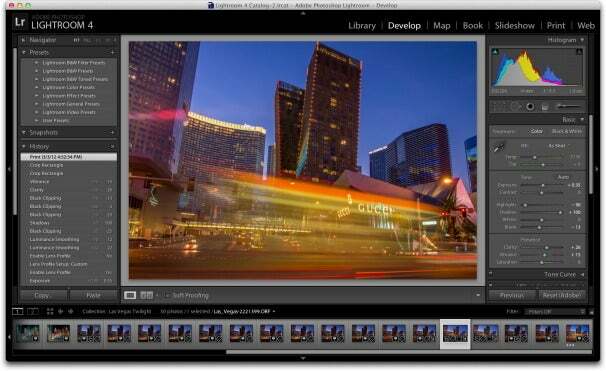 And Lightroom 4 certainly has expanded its functionality with video editing, book creation, geotagging, soft proofing, and more. But at the core of of this latest release is a refinement of what many already admire about this application: its ability to help you produce beautiful imagery. And in this category in particular, Lightroom 4 does not disappoint. Redesigned Basic panel in the Develop moduleThe Adobe mantra for Lightroom is Manage, Edit, Share. Editing work is accomplished via the tools in the Develop module, and it’s now easier than ever to work there. Starting with the first 11 sliders in the new Basic panel, you can improve all but the peskiest of images without delving deeper into the toolbox. On top you’ll see the Temperature and Tint controls for white balance, followed by Exposure and Contrast for luminance, then Highlights and Shadows for tonal recovery. Once you have the tones and color to your liking, add a bit of refinement with Clarity and Vibrance, and more often than not, you’re finished. In Lightroom 4, Adobe revisited the interface for these controls. All of the Basic sliders, except for White Balance, are “zeroed-out” in the center of the scale. Start with Exposure, for example. Move the marker to the left to darken the bright tones, and to the right to lighten them. It’s intuitive, and it reflects the way many photographers think about their photos. Even though the sliders themselves appear simple, there is plenty of sophisticated science behind their performance in Lightroom 4. Highlights and Shadows, for example, provide beautiful, graduated results. And if you need to work on a specific area, many of these color and luminance controls are available via the Adjustment Brushes, plus Sharpness, Noise, and Moire. Also, now in Lightroom 4, Chromatic Aberration is corrected via the application evaluating the image, opposed to using a standard camera/lens profile as before. This is easy and effective. Another enhancement in the Develop Module is Soft Proofing, which allows photographers to tune images for output to print or Web. Press the S key to switch the histogram to Soft Proofing mode. Choose the color profile you want to work with, such as Adobe RGB or sRGB, and then create a virtual soft proof that is placed in a stack alongside the original image. You can tell Lightroom to show gamut warnings that indicate where color shifting will appear for your chosen output. The warnings appear on your preview as a colored overlays. You can then use slider tools to adjust those areas, resulting in more accurate output compared to your computer screen. I put Soft Proofing to the test with a series of Las Vegas twilight shots I wanted to output via an Epson R2000 photo printer. Lightroom showed me areas of color that the printer would have difficulty reproducing. And when I adjusted the image to eliminate those warnings, the output was faithful to what I viewed on my Mac. But sometimes I felt that soft proofing was a bit conservative. I compared prints of the image that were not corrected in proofing with those that were. And I often preferred the vibrancy of the non-corrected print to the conservative accuracy of the soft proofs. For example in the photo below, I prefer the punch of the non-corrected image on the right compared to the accurate soft proof on the left. The point is that soft proofing is a helpful addition to Lightroom, but in many situations, especially artistic ones, you might not need this tool if you already have a printing workflow you like. And keep in mind there is more than one way to bring the colors into printing range. For example, instead of desaturating, a slight shift in hue could do the trick. Print comparison with soft proofing vs not. Soft proofing print on the left. Regular print workflow on the right. Soft proofing comparison on screen. Soft proof on the left. Brushing tools in the Develop moduleVideo clips from digital cameras can be imported and reside in the Grid view with photos. A neat trick, however, is that users can scrub through the clip by simply mousing over it. It’s fun and a helpful time saver. Lightroom automatically chooses the image for the thumbnail view, but that can be changed. It sounds like a small thing, but when there are dozens (or hundreds) of videos in your library, the ability to select the best poster frame for each is important. As expected, tools for trimming and grabbing a single frame from the snippets are included. But Lightroom 4 doesn’t stop there. Using the Quick Develop panel, budding movie makers can apply standard Lightroom presets (such as sepia toning), adjust white balance, change exposure, and tweak whites and blacks—all non-destructively, just like with still images. 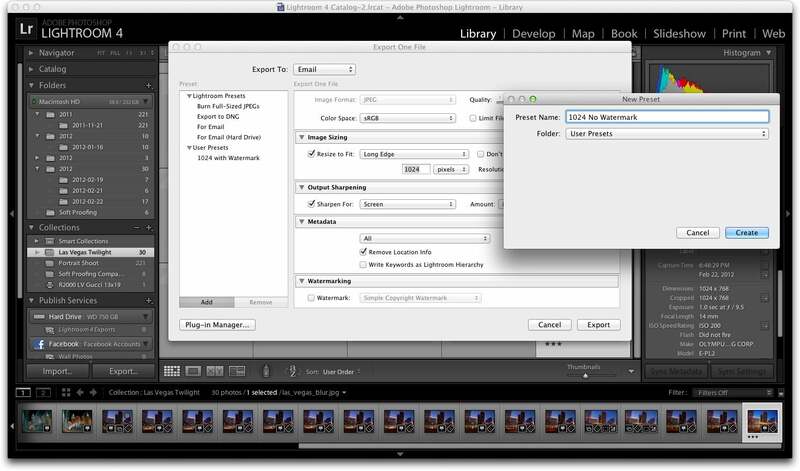 In fact, Lightroom 4 even lets you make virtual copies of video clips so you can experiment with different effects without maxing out your hard drive. If you need more editing tools than are what are available in the Quick Develop module, use the Capture Frame command, edit a single frame from the clip in the Develop Module, save those settings as a preset, then apply the preset to the entire clip. This works great. Edited video snippets, however, cannot be connected together and exported as a single multi-scene movie. This limits the functionality of working with movies in Lightroom. Since most photographers don’t shoot just in single takes, even for short videos, they will have to use another tool, such as Premier Elements to finish the project. This may lead some to bypass video work altogether in Lightroom. But there are organizational tools also. Snippets can be added to collections, labeled with stars, and marked with just about anything that would be used for photos. And when it’s time to publish, photographers can upload directly to Facebook and Flickr, or simply export snippets to their hard drive. For casual video recording, the convenience of working with movies in the same workflow as still photography is appealing. But those who shoot video regularly might be disappointed with the simplicity of Lightroom’s video handling. It’s now easier to share photos with friends and clients via email in Lightroom 4. Adobe has added a built-in email client that allows photographers to send single or multiple images using their existing mail accounts. Getting started involves telling Lightroom which account to use and letting Lightroom validate it. After that, the application will remember this information for future use. There’s also an Address Book feature that stores frequently used recipients. Unfortunately there isn’t an import function that allows users to tap their existing Address Book database on their Mac. The photo attachment can also be sent in a variety of sizes using a pop-up preset list. Users can create their own presets to suit their needs. First, select an image, then go to File -> Email Photo. A preset popup option appears at the bottom. Click on it and choose Create New Preset. Configure the specs to what you want, then click on the Add button in the lower left corner, then name the new preset. Sending images directly from Lightroom saves time compared to having to export them first, then attaching to mail. It’s not groundbreaking, but certainly a welcomed new feature. Adobe created an entirely new module for geotagging and included it, labeled as Map, in the top navigation bar. When in the Map module, you can drag and drop thumbnails from a Collection on to a map to add geotags to them, see where previously geotagged photos reside geographically, and even sync a tracking log that you’ve recorded with images in Lightroom. If you want to apply geocodes to a set of images, the first step actually begins in the Library module. There you need to put the pictures in a Collection. When you switch modes to Map, those Collections are available for geocoding. Use the Search Map box in the upper right corner to find and display the location on a map (Internet connection required for this). One you see the area where the pictures were taken on the map, you can simply drag and drop them and an orange pin will appear with the number of images that have been tagged for that location. 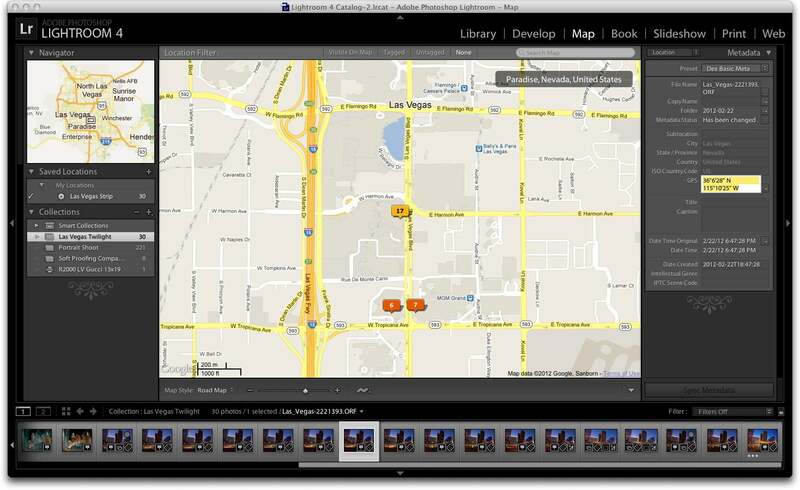 Lightroom will also add the latitude and longitude coordinates to the photo metadata. You have the option to include the location data or not with images during export. And overall, this feature is serviceable. But there isn’t much flexibility for changing your mind once pins have been set. 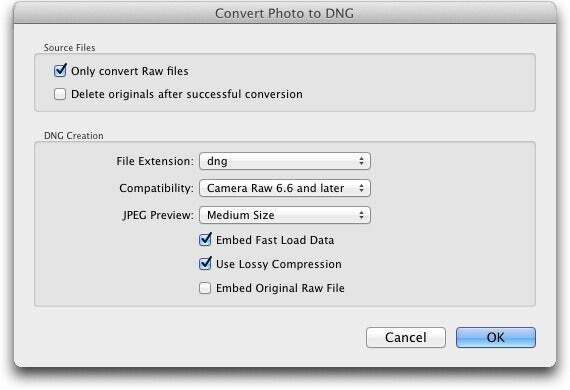 Lightroom offers new options for converting Raw files to DNG. You can enable Embed Fast Load Data for improved rendering speed. And now there’s a Lossy Compression choice that reduces the file size, but has minimum impact on file quality. This is an option to consider for your b-level files that you want to keep, but that aren’t necessarily your best images. The larger the originl file, the more the space savings. For a 24MB Raw image, reduction could render the file half its original size or less. A 12MB Raw file might only see 30 percent reduction. 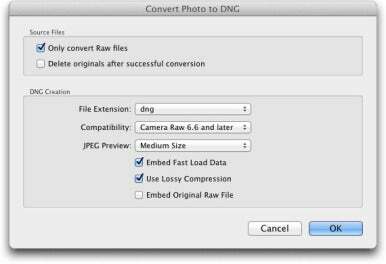 The flexibility of converting to DNG at different file sizes provides more flexibility when managing your overall library. 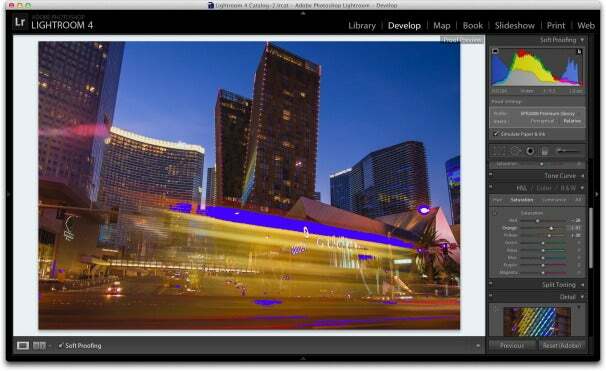 You can now design and output photo books within Lightroom. Adobe added the new module to the top menu bar, labeled as Book. 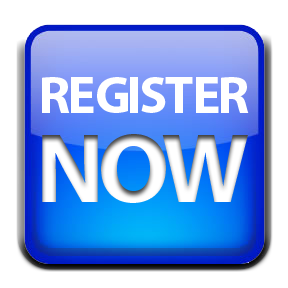 The easiest way to begin is to use the auto layout mechanism. Once you have a basic layout, you can fine-tune it using the various tools, including full type control. Since photographers aren’t always graphic artists, Adobe offers 180 predesigned layouts to choose from. And once you’re satisfied with the flow, you can send your project directly to Blurb for output, or render it as a PDF. iPad users might be interested in the latter. Design your book in Lightroom, export to PDF, then upload to an iPad for presentation. Overall, the Book module is easy to navigate. 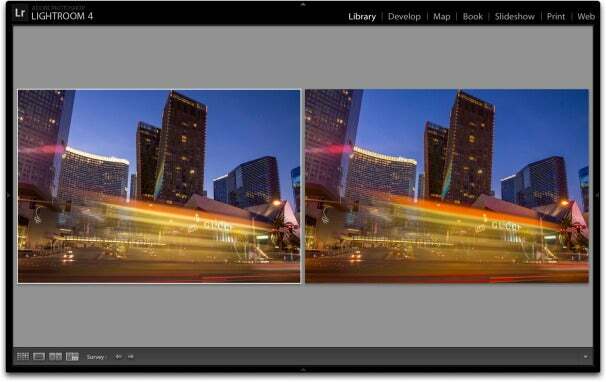 And once again, Adobe provides a helpful tool for photographers to work with in the Lightroom environment. Adobe Photoshop Lightroom 4 is worth the upgrade price for the Develop Module alone. The editing tools are more sophisticated than ever, yet often easier to use. And the refinements don’t stop there. Improved DNG output and email sharing might seem small at first, but with daily use of Lightroom, you’ll be glad they are there. Some of the big name additions, such as Map and Book, are certainly welcome. But the essence of this new version is the improved ability to make your photos look as good as possible. Editor’s Note: The article is reprinted from MACWorld.com.